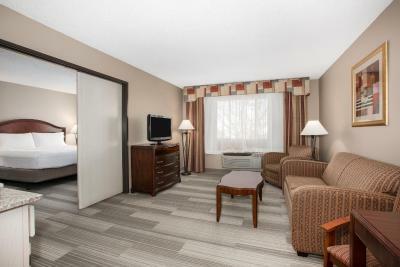 Lock in a great price for Holiday Inn Express Boulder – rated 8.3 by recent guests! Great location, friendly staff and good breakfast. Just minutes from downtown, easily accessible. The hotel was convenient to our needs, and the breakfast in the morning helps. I liked that the counter agent was nice and looked for a stowaway bed. The room was clean and the bed was comfortable. The staff made check in and check out a breeze. Parking was ample and the hotel is close to the shopping district. The breakfast staff went above and beyond to provide a great breakfast. 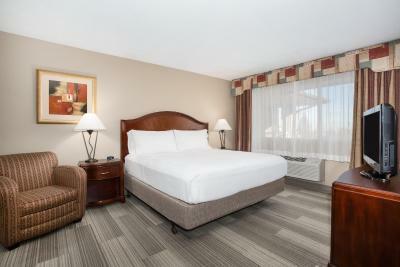 I’ve stayed at other HOLIDAY INN EXPRESS and this one was VERY CLEAN, the breakfast was abundant in the selections offered, the beds were very comfy and the ventilation in the room was excellent. The towels were very plush for a moderate accommodation. the food was tasty and plenty to choose from. beds were confortable. Better if some vegitable can be provided at breakfast. Loved the kitchenette. Large room. Very helpful staff. Holiday Inn Express Boulder This rating is a reflection of how the property compares to the industry standard when it comes to price, facilities and services available. It's based on a self-evaluation by the property. Use this rating to help choose your stay! This hotel has a seasonal outdoor pool and offers a free hot breakfast daily. Just off Highway 36 in Boulder, the hotel is 35 miles from Rocky Mountain National Park. All rooms at the Holiday Inn Express Boulder have free cable on flat-screen TVs. Guests will find a microwave and refrigerator, as well as a work desk and ironing facilities. Some rooms have separate seating areas with a sofa bed, and rooms with dining areas and a balcony are available. Along with the seasonal pool and year-round hot tub, the Boulder Holiday Inn Express has a fitness center. There is a business center for guest use and free WiFi access throughout the hotel. The campus of the University of Colorado Boulder is 5 miles from the hotel. The Flatirons and Haystack Mountain golf courses are both within 5 miles. The visitor center of the National Center for Atmospheric Research is 6 miles away. When would you like to stay at Holiday Inn Express Boulder? Offering a flat-screen cable TV, this room includes tea and coffee-making facilities and an private bathroom. Please note that bedding configurations are based on availability and cannot be guaranteed. Contact the property for more information. With a flat-screen cable TV, this room has tea and coffee-making facilities and a private bathroom. Along with a sofa bed and separate lounge, full kitchen and dining area, this room has a balcony. This room has a sofa bed and separate lounge, a full kitchen and dining area. This room has a sofa bed and separate seating area. House Rules Holiday Inn Express Boulder takes special requests – add in the next step! Holiday Inn Express Boulder accepts these cards and reserves the right to temporarily hold an amount prior to arrival. The air conditioner made a bit of noise. The staff was very friendly and helpful. They treated us very well. We feel taken care of by them. The curtains were see through. Lack of privacy! Housecleaning could be improved. I had to grab more soap one day since they did not leave any. The carts were kept outside our room so that was convenient. The room smelled like the previous occupants smoked in the room. When I did my search I put in that I had 3 people and was pretty sure Booking .com looked for double rooms and was pretty sure that’s what I booked. When I got there we only had one queen bed for 3 of us 😕. Fortunately, they found a crappy stowaway bed or one of us would have been on the floor. The counter person said that when you use booking.com you’re not guaranteed the room you requested. Room was clean but small and smelled like smoke. Paid $300 second night because they jack up the prices whenever there is a CU event. Will not stay there again and hesitate to use booking.com again if hotels won’t guarantee what you book. Good breakfast. Staff was very helpful. Be very careful. We booked in advance for full price. On the day they advertised rooms for half that. This place is not worth full price. Breakfast borderline adequate. Refrigerator in room very loud, made it hard to sleep. Toilet ran constantly. Staff great. Bed very comfy, loved all the pillows.